Angioplasty—also called “percutaneous transluminal coronary angioplasty,” or PTCA—is a catheterization procedure aimed at relieving blockages within arteries, most commonly in the coronary arteries. Angioplasty is performed by inflating a tiny balloon within the blocked artery at the site of an atherosclerotic plaque, thus flattening the plaque and reducing the stenosis (blockage) within the artery. In almost every case angioplasty is accompanied by insertion of a stent. To perform an angioplasty, the doctor uses a catheter (a long, thin, flexible tube) that has a deflated balloon attached to it. The catheter is passed across the plaque that is producing the blockage, and the balloon is inflated under pressure. The expansion of the balloon compresses the plaque against the wall of the artery. When the balloon is deflated and removed, the plaque remains at least partly compressed, so the blockage is reduced. While angioplasty was originally performed as a stand-alone procedure, today a stent is also inserted in virtually every case, whenever angioplasty is performed on a coronary artery. A stent is an expandable “scaffold” that helps support the wall of the artery at the site of angioplasty, in order to keep the plaque compressed. The collapsed stent is placed over the balloon before it is inserted. Then, when the balloon is inflated, the plaque is compressed and the stent is expanded at the same time. When the balloon is then deflated and removed, the stent is left in place, helping to keep the plaque compressed and the artery open. Angioplasty is quite effective in reducing the symptoms of stable angina. So the main reason for doing angioplasty in a coronary artery is to treat angina that remains persistent despite attempts at medical therapy. While it may seem surprising to many, angioplasty (even when a stent is inserted) has not been shown to be more effective than medical therapy in reducing the subsequent risk of myocardial infarction (heart attack), or to improve survival. So the main reason for performing angioplasty is to relieve stable angina that has persisted despite attempts to treat it medically. The second reason angioplasty (and stenting) is often used in treating coronary artery disease is in people who have acute coronary syndrome (ACS). In ACS, an acute blockage of a coronary artery has occurred because a plaque has ruptured and a clot has formed within the artery. When ACS is occurring, a heart attack is very likely unless the artery is opened. 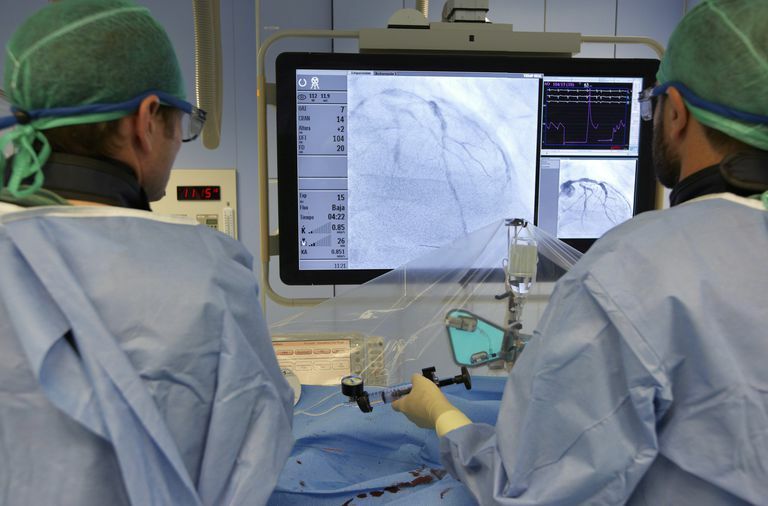 During ACS, the available evidence shows that angioplasty and stenting can help substantially to improve overall cardiac outcomes. The coronary arteries are not the only arteries in which angioplasty is routinely used to treat obstructive atherosclerotic plaques. Angioplasty is also applied to the carotid arteries (which supply the brain), the renal arteries (which supply the kidneys) and the leg arteries. Like any catheterization procedure, which requires the insertion of a catheter into a blood vessel, angioplasty carries the risk of damage to the blood vessel being used for the procedure, as well as a risk of bleeding and infection. Acute damage may also occur in the “target” artery — the vessel in which the angioplasty procedure is being carried out. This damage may include blood clot formation, or dissection of the artery. Either of these complications can produce permanent damage to the organ being supplied by that artery (the heart, brain, kidneys, or legs). The most common long-term complication following angioplasty is restenosis— the formation of a new blockage at the site of the compressed plaque. Restenosis is a relatively gradual process caused by the new growth of tissue—probably in response to the trauma produced in and around the vessel wall by the angioplasty itself. The incidence of restenosis has been greatly diminished by the use of stents, especially drug-eluting stents (DES), which are coated with medication that inhibits the growth of tissue, thus reducing restenosis. Before the era of stents, late restenosis occurred in nearly 30% of patients who had angioplasty alone. The use of bare metal stents reduced this risk to less than 15%, and drug-eluting stents reduced it further to less than 10%. A less common problem, but a more devastating one, is thrombosis (blood clotting) at the site of angioplasty/stenting. Stent thrombosis is a sudden and often catastrophic event, which typically produces acute and complete obstruction of the affected artery. Thrombosis is most commonly seen soon after the angioplasty procedure (that is, within days to weeks). However, when a stent has been inserted during the angioplasty (which is almost always the case today), a low risk of thrombosis persists for several months to several years after the procedure. The risk of thrombosis is significantly reduced by the use of anti-platelet drugs—which, however, carry their own risks. Other complications that can occur during angioplasty include damage to the organ being supplied by the blood vessel being treated (including heart attack, kidney damage or stroke), cardiac arrhythmias, or bleeding. Before you have an angioplasty procedure your doctor will perform a full medical history and physical exam. You will also have a chest x-ray, electrocardiogram, and blood tests. You may have a separate angiogram procedure (a dye study to visualize blockages in arteries) prior to the angioplasty, to assess whether an angioplasty (and stent) is a suitable approach. Or, as is often the case (and as is always the case when the angioplasty/stent is being done as an urgent procedure during an acute or impending heart attack), the angiogram procedure will be done along with the angioplasty as a single procedure. If you are having a single procedure, your doctor will fully describe to you the potential risks and benefits of both procedures ahead of time. Part of this discussion should be on the importance of taking blood-thinners after the procedure, how long you can expect to take them, and of the risks involved with these drugs. Timing. Angioplasty and stenting are often done as a pre-planned procedure for an ongoing problem, but they are also done frequently as an emergency procedure, especially in people who are having an ACS event. Location. Angioplasty/stent procedures are done in a cardiac catherization laboratory, located in a hospital. What to wear. Before the angioplasty/stent are performed, you will be taking off all your clothes and putting on a hospital gown, so you can wear anything you like on the day of the procedure. Food and drink. You will need to stop eating and drinking for up to 8 hours before the procedure. If the procedure is an emergency, the doctor will talk to you about when you last ate, and will decide when it is reasonably safe to proceed. For an elective procedure, your doctor will instruct you on how to take your medications before the procedure. Cost and insurance. Angioplasty/stent procedures are very expensive, though the cost varies substantially from hospital to hospital. If you have health insurance there is an excellent chance your insurance will be covering it, especially if it is being done as an emergency. However, before any elective procedure you should contact your insurance company to see whether it will be covered, and what your out-of-pocket responsibility may be. What to bring. Most people will need to spend at least one night in the hospital after an angioplasty procedure, so you may want to bring a book with you, and anything else that might make you more comfortable, such as a favorite pair of slippers. You will also need to have somebody else drive you home when you are discharged. Pre-procedure. On the day of the angioplasty, you will need to check in to the facility and present all your insurance documents, so give yourself some extra time. After being checked in, you will be taken to a locker room where you will undress and put on a gown. A medical professional will take an updated history to see if anything has changed since you last saw the doctor, and will perform a quick physical examination. You will definitely be asked about the last time you ate or drank anything. During the Procedure. You will be brought into the catheterization laboratory, and you will lie down on the catheterization table. The room will be a little chilly, but once the procedure is ready to begin you will have warmed up with blankets. You may be given a mild sedative, but you will be awake for this procedure. The artery that is being used to insert the catheter (which may be the brachial artery in the arm, the radial artery in the wrist, or the femoral artery in the groin) will be carefully scrubbed and sterilized, and likely covered with a cellophane-like sheet. After numbing up the area, the doctor will insert a needle into your artery, and then insert the catheter through the opening made by the needle. No incision will be necessary. The angioplasty procedure can take a few hours, or as little as 45 minutes, depending on the number of blockages that need to be treated, and on any complications that might arise. You can expect to be kept comfortable during the procedure, and will be given IV fluids and medication as necessary to keep you comfortable. Post-procedure. After the angioplasty/stent is finished, the doctor will quickly remove the catheter, and place pressure on the artery for several minutes to prevent bleeding. You will be kept on a cardiac monitor overnight, and will be able to begin eating and drinking as soon as the sedation has worn off sufficiently — usually within a half-hour or so. If your procedure was done as an emergency because you were having an ACS event, you will likely need to stay in the hospital several days for monitoring and recovery. You may have discomfort and possibly some bruising at the site of catheter insertion, which should gradually improve over a few days. You should refrain from lifting heavy objects during this period. If there are any other restrictions that apply especially to you, your doctor will tell you about them. Most people can return to driving and to work the week after the procedure. For several days after returning home you should watch for bleeding, swelling, redness, pain, or drainage from the catheter insertion site.You should also watch for any change in the color of the leg (or arm) used for the procedure. Call the doctor if you see any of these. Also call the doctor if you have chest discomfort, shortness of breath, or begin feeling unusually weak or faint. Generally your doctor will want to see you in follow-up in 2 - 4 weeks. After angioplasty, and especially if you have a stent, you will need to take blood-thinning medications (such as Plavix) to prevent blood clots from forming at the site of angioplasty. Your doctor will give you a prescription, and instruct you on side effects to watch out for. If you are having an angioplasty procedure, that means that you very likely have atherosclerosis. Atherosclerosis is a chronic, progressive disease that is not cured or even slowed down by angioplasty (which “merely” relieves one of the blockages caused by atherosclerosis). To slow down the progression of atherosclerosis and reduce the risk of developing more blockages, you will need to take every measure at your disposal to reduce your risk. This means not smoking, controlling your weight, getting plenty of exercise, and controlling your blood pressure, cholesterol, and (if you have it) diabetes. Your doctor should help you to get on a program to control these important risk factors. Angioplasty (and stent placement) is an effective procedure to quickly relieve a blockage within an artery caused by an atherosclerotic plaque. It is an effective method of improving stable angina when medications aren’t giving sufficient relief, and it can help to greatly improve outcomes in people who are having one of the acute coronary syndromes. While this procedure does carry certain risks, it can most often be carried out safely, and when it is done for the right reasons the benefits usually outweigh any risks. Did you know the most common forms of heart disease are largely preventable? Our guide will show you what puts you at risk, and how to take control of your heart health. Authors/Task Force members, Windecker S, Kolh P, et al. 2014 ESC/EACTS Guidelines on Myocardial Revascularization: The Task Force on Myocardial Revascularization of the European Society of Cardiology (ESC) and the European Association for Cardio-Thoracic Surgery (EACTS)Developed with the special contribution of the European Association of Percutaneous Cardiovascular Interventions (EAPCI). Eur Heart J 2014; 35:2541. Fihn SD, Blankenship JC, Alexander KP, et al. 2014 ACC/AHA/AATS/PCNA/SCAI/STS Focused Update of the Guideline for the Diagnosis and Management of Patients with Stable Ischemic Heart Disease: a Report of the American College of Cardiology/American Heart Association Task Force on Practice Guidelines, and the American Association for Thoracic Surgery, Preventive Cardiovascular Nurses Association, Society for Cardiovascular Angiography and Interventions, and Society of Thoracic Surgeons. J Am Coll Cardiol 2014; 64:1929. Are Stents Really Useful for Stable Angina? Should You Have a Coronary Calcium Scan? Do Angioplasty and Stents Increase Life Expectancy?